From this Certificate, you can tell that you have $100 credit towards your order, provided the purchase is made PRIOR to December of 2014. If you are redeeming the Certificate in person at the nursery, then the value of your Certificate is applied against your purchase. If you exceed the value of the Certificate, then you will be asked to pay the outstanding balance. If your purchase is less than the Certificate, the value of the Certificate will be reduced by the total value of your purchase. 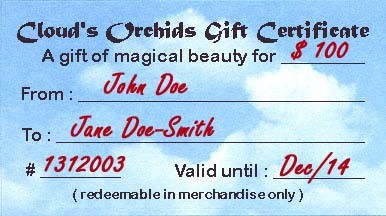 NOTE: Under NO circumstances will you receive cash back or a cash-discount when using a Gift Certificate ! Please make sure to complete the entire order form, including your Credit Card information. Handling of the Gift Certificate will be as in STEP 2 above. Along with the order confirmation, you will also be informed of the current status and value remaining of the Gift Certificate (if applicable). Congratulations, you're all done now ... we hope you enjoy shopping, and felicitations !